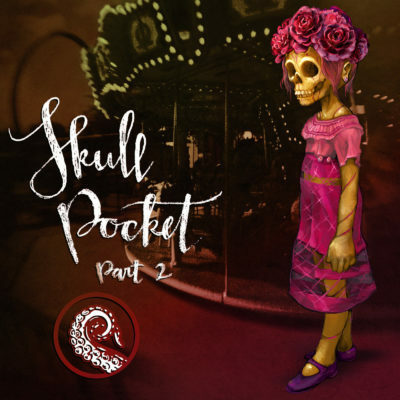 The Drabblecast completes its triumphant return with the conclusion of this two-part Halloween special: “Skullpocket: Part 2” by Nathan Ballingrud! In this riveting finale we learn the origins of the Orchid Girl, the mystery behind Skull Pocket Fair, and the horrible truth behind the Extinction Event. A freak show awaits you indeed! But everything changed when Wormcake and his friends entered the room. The Orchid Girl sat a bit straighter, as if she had heard or felt something peculiar. She stood on her feet and looked out at the crowd. Almost immediately her gaze fell upon the ghoul children, as though she could sense them through some preternatural ability, and then, children, the most amazing thing happened. The thing that changed the ghouls’ lives, her own life, and the lives of everyone in Hob’s Landing forever afterward. Her face opened along the red lines and bloomed in bright, glorious petals of white and purple and green. Her body was only a disguise, you see. She was a gorgeous flower masquerading as a human being. Nathan Ballingrund is a Shirley Jackson Award winning author of horror and dark fiction. Part One of his tale was published last week so give that a listen if you haven’t. We’re also happy to announce that the Drabblecast Reborn Preorder Store is now up and running. We’ve got a whole bunch of cool schwag up there to check out. So if you wanted to get your hands on some of our exclusive Kickstarter items and you weren’t able to back us, or you wanna beef up your support, this is the place. What’s next, children? What is it you really came to hear about? It’s as though he’s thrown a lit match into a barrel of firecrackers. They all explode at once. Uncle Digby raises his metal arms and a chuckle emits from the voice box beneath the jar. The bubbles churn with a little extra gusto around his floating head, and I think, for a moment, that it really is possible to read joy in that featureless aspect. Whatever tensions might have been festering just a few moments ago, they’re all swept aside by the manic excitement generated by the promise of the freaks. This is what they’ve been waiting to hear. Yes, well, oh my, what a surprise. I thought you wanted to learn more about ghoul history. Maybe learn the names of all the elders? Or learn how they harvested food from the coffins? It’s really a fascinating process, you know. Well, well, well. The freaks it is, then. Is Juul the Best Pod Vape or What? He tapped the sign with a long finger, drawing their attention back to it. Beneath the word FREAKS was a list of words in smaller size, painted in an elegant hand. Words like The Most Beautiful Mermaid in the World, The Giant with Two Faces, and—you guessed it—The Orchid Girl. They joined the line going inside. Curtains partitioned the interior into three rooms, and the crowd was funneled into a line. Lanterns hung from poles, and strings of lights crisscrossed the top of the tent. The first freak was a man in a cage. He was seven feet tall, dressed in a pair of ratty trousers. He looked sleepy, and not terribly smart. He hadn’t shaved in some time, his beard bristling like a thicket down his right cheek and jowl. The beard grew spottily on the left side, mostly because of the second face which grew there: doughy and half formed, like a face had just slid down the side of the head and bunched up on the neck. It had one blinking blue eye, and a nose right next to it, where the other eye should have been. And there was a big, gaping mouth, nestled between the neck and shoulder, with a little tongue that darted out to moisten the chapped lips. A sign hanging below his cage said, BRUNO: EATER OF CHILDREN. The ghouls were fascinated by the second face, but the eating children part didn’t seem all that remarkable to them. They’d eaten plenty themselves. Next up was THE WORLD’S MOST BEAUTIFUL MERMAID. This one was a bit frustrating, because she was in a tank, and she was lying on the bottom of it. The scaly flesh of her tail was pressed up against the glass, so at first they thought they were looking at nothing more than a huge carp. Only after staring a moment did they notice the human torso which grew from it, curled around itself to hide from the gaze of the visitors. It was a woman’s back, her spine ridged along her sun-dark skin. Long black hair floated around her head like a cloud of ink from an octopus. Finally they progressed into the next partition, and they came to THE ORCHID GIRL. She stood on a platform in the back of the tent, in a huge bell jar. She was just about your age, children. She was wearing a bright blue dress, and she was sitting down with her arms wrapped around her legs, looking out balefully at the crowds of people coming in to see her. She looked quite unhappy. She did not look, at first blush, like a freak; the only thing unusual about her were what appeared to be pale red scars running in long, S-like curves down her face. Well, here was another disappointing exhibit, the people thought, and they were becoming quite agitated. Someone yelled something at her, and there was talk of demanding their money back. The people screamed, or dropped to their knees in wonder. Some scattered like roaches in sunlight. Wormcake and his friends ran, too. They fled through the crowd and back out into the night. They were not afraid; they were caught in the grip of destiny. Wormcake, suddenly, was in love. He fled from the terror and the beauty of it. To us, though, she looked like a visitation from another, better world. That we didn’t have a choice—the summons of the Maggot was not to be ignored—didn’t enter our minds. We felt anointed by her welcome. We knew we’d been made special, and that everyone in Hob’s Landing envied us. She led us into the drawing room—the one that would host every meeting like this for years to come—where Uncle Digby was waiting to tell us the story. We knew him already through his several diplomatic excursions into town, and were put at ease by his presence. The Orchid Girl joined her husband in two chairs off to the side, and they held hands while they listened. I sat next to Christina Laudener. We were the oldest. The idea of romantic love was still alien to us, but not so alien that I didn’t feel a twinge when I saw Mr. Wormcake and his wife holding hands. I felt as though I were in the grip of some implacable current, and that my life was being moved along a course that would see me elevated far beyond my current circumstance. As though I were the hero of a story, and this was my first chapter. I knew that Christina was a part of it. I glanced at her, tried to fathom whether or not she felt it, too. She caught my look and gave me the biggest smile I’d ever received from a girl, before or since. I have kept the memory of that smile with me, like a lantern, for the small hours of the night. I call upon it, with shame, even now. The Maggot disapproves of sentiment. Do you know what an Extinction Rite is, children?Uncle Digby asks. A few of the children shake their heads. Others are still, either afraid to answer the question or unsure of what their answer ought to be. On the night of the Cold Water Fair, all those years ago, the ghouls under the hill had reached the end of their age. Ghoul society, unlike yours, recognizes when its pinnacle is behind it. Once this point has been reached, there are two options: assimilate into a larger ghoul city, or die. The ghouls under the hill did not find a larger city to join, and indeed many did not want to anyway. Their little city had endured for hundreds of years, and they were tired. The Maggot had delivered to the elders a dream of death, and so the Extinction Rite was prepared. The Extinction Rite, children, is the suicide of a city. Like you, I am not a ghoul. I have never seen this rite performed. But also like you, I belong to the church introduced to Hob’s Landing by Mr. Wormcake, so I can imagine it. I believe it must be a sight of almost impossible beauty. But I am glad he did not participate that night. Do you know what would have happened here in town if he had? He looks at the little girl who talked back earlier.What do you think, dear? Precisely. Nothing would have happened. They would have gone back inside when called, just like old Stubblegut wanted. They would have missed the fair. They would never have met the Orchid Girl, or dear old Bruno, or the lost caravan leader of the mermaid nation. I myself would still be frozen in the attic, with my sixteen compatriots, just another brain in a jar. The Extinction Rite would have scoured away all the ghouls in the hill, and the people of Hob’s Landing would have been none the wiser. Their little town would now be just another poverty-ridden fishing village, slowly dissolving into irrelevance. The ghoul children ran out of the tent that night, their little minds atilt with the inexplicable beauties they had just seen. It was as though the world had cracked open like some wonderful geode. They were exhilarated. They stood in the thronged midway, wondering what they ought to do next. Slipwicket and Stubblegut wanted to celebrate; the memory of their unfinished game of skullpocket was cresting in their thoughts, and the urge to recommence the game exerted itself upon them like the pull of gravity. Wormcake thought only of the Orchid Girl, imprisoned like a princess in one of the old tales, separated from him by a thin sheet of glass and by the impossible chasm of an alien culture. And unbeknownst to them, in the warrens, the Extinction Rite reached its conclusion, and the will of the ghouls was made known to their god. And so the Maggot spoke. Not just to these children, but to every ghoul in the city under the hill. A pulse of approval, a wordless will to proceed. The Maggot said, DO IT. What happened then was an accident. The Extinction Rite was not meant to affect the people of Hob’s Landing at all. If Wormcake and the others had been at home, where they belonged, the Maggot’s imperative would have caused them to destroy themselves. But they were not at home. And so what they heard was permission to indulge the desires of their hearts. And so they did. Slipwicket fell upon the nearest child and tore the flesh from his skull like the rind from an orange, peeling it to the bone in under a minute. Stubblegut, caught in the spirit of the moment, chose to help him. Bright streamers of blood arced through the air over their heads, splashed onto their faces. They wrestled the greasy skull from the body and Slipwicket gave it a mighty kick, sending it bouncing and rolling in a jolly tumble down the midway. Wormcake made his way back into the tent, slashing out with his sharp little fingers at the legs of anybody who failed to get out of his way quickly enough, splitting tendons and cracking kneecaps, leaving a bloody tangle of crippled people behind him. Above them all, the cemetery on the hill split open like a rotten fruit. From the exposed tunnels beneath the upturned clods of earth and tumbling gravestones came the spirits of the extinguished city of the ghouls: a host of buzzing angels, their faceted eyes glinting moonlight, their mandibles a-clatter, pale, iridescent wings filling the sky with the holy drone of the swarm. People began to scream and run. Oh, what a sound! It was like a symphony. It was just what Wormcake and his friends had been hoping for when they first looked down at the fair and heard the sounds carrying to them on the wind. They felt like grand heroes in a story, with the music swelling to match their achievements. Slipwicket and Stubblegut batted the skull between them for a few moments, but it proved surprisingly fragile when careening off a fencepost. Of course there was nothing to do but get another. So they did, and, preparing for future disappointments, they quickly decided that they should gather a whole stockpile of them. Wormcake opened Bruno’s cage and smashed the Orchid Girl’s glass dome, but he was afraid to smash the mermaid’s tank, for fear that she would die. Bruno—who had become great friends with her—lifted her out and hastened her down to the water, where she disappeared with a grateful wave. When he returned to the party, the ghouls were delighted to discover that he was called the Eater of Children for very good reason indeed. The Orchid Girl stood off to the side, the unfurling spirits of the cemetery rising like black smoke behind her, the unfurled petals of her head seeming to catch the moonlight and reflect it back like a strange lantern. Wormcake stood beside her and together they watched as the others capered and sported. Beautiful carnage. Screams rising in scale before being choked off in the long dark of death, people swarming in panic like flies around a carcass, corpses littering the ground in outlandish positions one never finds in staid old coffins. Watching the people make the transition from antic foolishness to the dignified stillness of death reassured Wormcake of the nobility of their efforts, the rightness of their choices. He recognized the death of his home, but he was a disciple of the Maggot, after all, and he felt no grief for it. What did the two of them talk about, standing there together, surrounded by death’s flowering? Well, young master Wormcake never told me. But I bet I can guess, just a little bit. They were just alike, those two. Different from everyone else around them, unafraid of the world’s dangers. They recognized something of themselves in each other, I think. In any case, when they were finished talking, there was no doubt that they would take on whatever came next together. It was the Orchid Girl who spotted the procession of torches coming from Hob’s Landing. What happened next, children, is common knowledge, and not part of tonight’s story. The Orchid Girl was right: the people of Hob’s Landing were frightened of the mansion and did not follow them there. Wormcake and his friends found a new life inside. They found me, and the rest of the Frozen Parliament, up in the attic; they found the homunculus in the library; and of course, over time, they found all the secrets of the strange old alchemist who used to live there, which included the Orchid Girl’s hidden history. Most importantly, though, they made themselves into a family. Eventually they even fashioned a peace with Hob’s Landing and were able to build relationships with people in the town. That was the last night the Cold Water Fair was ever held in Hob’s Landing. With fourteen dead children and a family of monsters moved into the old mansion, the citizens of the town had lost their taste for it. For the better part of a generation, there was little celebration at all in the little hamlet. Relations between the Wormcake family and the townsfolk were defined by mutual suspicion, misunderstanding, and fear. Progress was slow. Thirty years later, relations had repaired enough that Mr. Wormcake founded the Skullpocket Fair. To commemorate the night he first came to Hob’s Landing, found the love of his life, and began his long and beneficial relationship with this town, where he would eventually become the honored citizen you all know him as today. And now, at last, we come to why the Maggot called you all here! This is what Mr. Wormcake tells me, after Uncle Digby ushers the children from the drawing room. The sun has set outside, and the purpling sky seems lit from behind. “You know, he tells the story for children. He leaves out some details. That night in the freak tent, for instance. The people gathered around the mermaid were terrifying. There was a feral rage in that room. I didn’t know what it was at the time. I was just a kid. But it was a dark sexual energy. An animal urge. They slapped their palms against her tank. They shouted at her. Said horrible things. She was curled away from them, so they couldn’t see her naked, and that made them angry. I was afraid they would try to break the glass to get at her. I think it was only the fear of Bruno the cannibal, in the other room, somehow getting out, too, that stopped them. I don’t know. “Is it hard to talk about her?” Probing for signs of blasphemy. He does. He turns away from me and stares through the window. The bay is out there somewhere, covered in the night. The lights in the drawing room obscure the view, and we can see our reflections hovering out there above the waters, like gentlemanly spirits. “Take me to the chapel,” I tell him quietly. He pushes through a small door behind the chess table and enters a narrow, carpeted hallway. Lamps fixed to the walls offer pale light. There are paintings hung here, too, but the light is dim and we are moving too quickly for me to make out specific details. The faces look desiccated, though. One seems to be a body seated on a divan, completely obscured by cobwebs. Another is a pastoral scene, a barrow mound surrounded by a fence made from the human bone. At the end of the corridor, another small door opens into a private chapel. I’m immediately struck by the scent of spoiled meat. A bank of candles near the altar provides a shivering light. On the altar itself, a husk of unidentifiable flesh bleeds onto a silver platter. Scores of flies lift and fall, their droning presence crowding the ears. On the wall behind them, stained glass windows flank a much larger window covered in heavy drapes. The stained glass depicts images of fly-winged angels, their faceted ruby eyes bright, their segmented arms spread as though offering benediction, or as though preparing to alight at the butcher’s feast. There is a pillow on the floor in front of the altar, and a pickax leans on the table beside it. The Maggot summons fourteen children to the Skullpocket Fair every year. One for each child that died that night in the Cold Water Fair, one hundred years ago, when Hob’s Landing became a new town, guided by monsters and their strange new god. It’s no good to question by what criteria the children are selected, by what sins or what virtues. There is no denying the summons. There is only the lesson of the worm, delivered over and over again: all life is a mass of wriggling grubs, awaiting the transformation to the form in which it will greet the long and quiet dark. “I know,” says Mr. Wormcake. I’m stunned by the magnitude of this confession. I’d been fooled by the glamour of his name and his history; I’d thought he would greet this moment with all the dignity of his station. I stand over him, this diminished patriarch, mewling like some abandoned infant, and I’m overwhelmed by disgust. I don’t know where it comes from, and the force of it terrifies me. Fifty years ago, when Uncle Digby finished his story and finally opened the gate at the very first Skullpocket Fair, we all ran out onto the brand-new midway, the lights swirling around us, the smells of sweets and fried foods filling our noses. We were driven by fear and hope. We knew death opened its mouth behind us, and we felt every living second pass through our bodies like tongues of fire, exalting us, carving us down to our very spirits. We heard the second gate swing open and we screamed as the monsters bounded onto the midway in furious pursuit: cannibal children, dogs bred to run on beams of moonlight, corpse flowers with human bodies, loping atrocities of the laboratory. The air stank of fear. Little Eddie Brach was in front of me and without thought I grabbed his shirt collar and yanked him down, leaping over his sprawled form in the very next instant. He bleated in cartoonlike surprise. I felt his blood splash against the back of my shirt in a hot torrent as the monsters took him, and I laughed with joy and relief. I saw Christina leap onto a rising gondola car and I followed. We slammed the door shut and watched the world bleed out beneath us. Our hearts were incandescent, and we clutched each other close. Somewhere below us a thing was chanting, “Empty your pockets, empty your pockets,” followed by the hollow pok! of skulls being cracked open. We laughed together. I felt the inferno of life. I knew that every promise would be fulfilled. Six of us survived that night. Of those, four of us—exalted by the experience—took the orders. We lived a life dedicated to the Maggot, living in quiet seclusion, preparing our bodies and our minds for the time of decay. We proselytized, grew our numbers. Every year some of the survivors of the fair would join us in our work. Together, we brought Hob’s Landing to the worm. But standing over this whimpering creature, I find myself thinking only of Christina Laudener, her eyes a pale North Atlantic gray, her blond hair flowing like a stilled wave over her shoulders. We were children. We didn’t know anything about love. Or at least I didn’t. I didn’t understand what it was that had taken root in me until years later, when her life took her to a different place, and I sat in the underground church and contemplated the deliquescence of flesh until the hope for warmth, or for the touch of a kind hand, turned cold inside me. I never learned what she did with her life. But she never took the orders. She lived that incandescent moment with the rest of us, but she drew an entirely different lesson from it. I think of my own life, long for a human being, spent in cold subterranean chambers. “The Maggot isn’t a lie,” I say. “I shouldn’t have survived. I should have died. I pushed Eddie down. Eddie should have lived.” I feel tears try to gather, but they won’t fall. I want them to. I think, somehow, I would feel better about things if they did. But I’ve been a good boy: I’ve worked too hard at killing my own grief. Now that I finally need it, there just isn’t enough anymore. The Maggot has taken too much. He gets up, approaches the windows. He pulls a cord behind the curtains and they slide open. A beautiful, kaleidoscopic light fills the room. 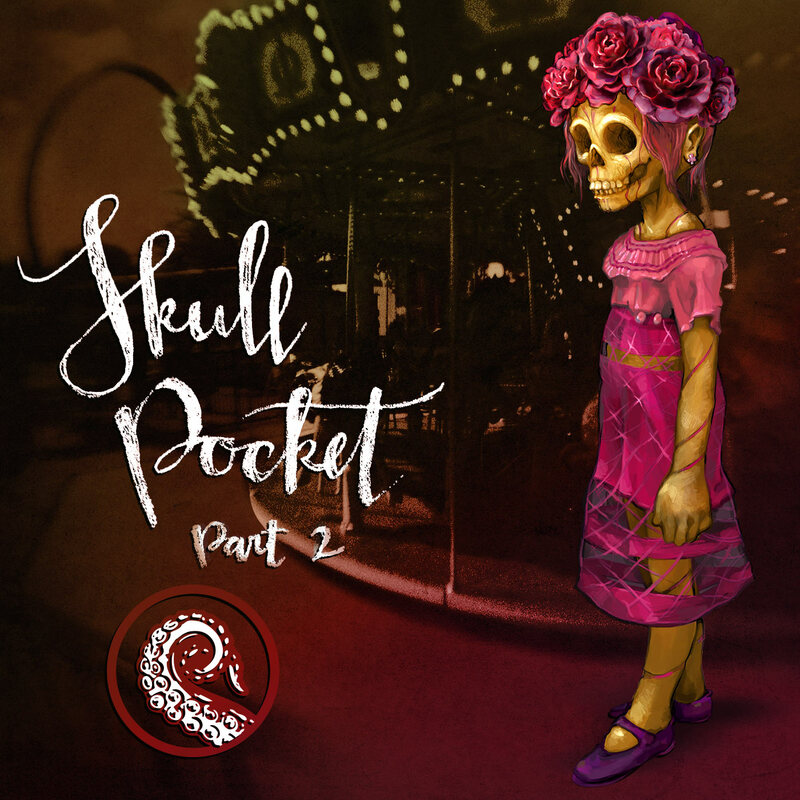 The Seventieth Annual Skullpocket Fair is laid out on the mansion’s grounds beyond the window, carousels spinning, roller coaster ticking up an incline, bumper cars spitting arcs of electricity. The Ferris wheel turns over it all, throwing sparking yellow and green and red light into the sky. He tugs at the false mouth on his skull, snapping the tethers, and tosses it to the floor. The tongue lolls like some yanked organ, and the flies cover it greedily. Maybe he believes that if he can no longer articulate his grief, he won’t feel it anymore. He removes the fly-spangled meat from my hands and takes a deep bite. He offers it to me: a benediction. I recognize the kindness in it. I accept, and take a bite of my own. This is the world we’ve made. Tears flood my eyes, and he touches my cheek with his bony hand. Then he replaces the meat on the altar and resumes his place on his knees beside it. He lays his head by the buzzing meat. I take the pickax and place the hard point of it against the skull, where all the poisons of the world have gathered, have slowed him, have weighed him to the earth. I hold the point there to fix it in my mind, and then I lift the ax over my head. “Empty your pockets,” I say. Below us, a gate opens, and the children pour out at a dead run. There goes the angry girl. There goes the weepy, buzz-cut kid. Arms and legs pumping, clothes flapping like banners in the wind. They’re in the middle of the pack when the monsters are released. They have a chance. They just barely have a chance.